PROMONTORY, UTAH - It began with light, then the cheer of the large crowd of onlookers and then came the thunder. The "it" was the test firing of the Development Motor-2 (DM-2). The test was conducted in the deserts of Utah. At 9:27 a.m. MDT. From just a mile away one could feel the searing heat of the solid rocket motor as it powered through the two-minute, five-second test. The skies and hills of the local area were filled with a huge plume of smoke, billowing thousands of feet into the clear, blue sky, as the region was seared by blindingly bright light. The Aug. 31 test marks the second time that NASA and ATK has tested one of these motors intended for use in the Ares family of rockets. Even as NASA's future is hammered out by politicians in Washington D.C. the engineers and technicians that work to make the space program happen - continues on with their tasks. The Ares rockets are part of the Constellation Program, a program currently scheduled to be cancelled. This test was attended by numerous experts and dignitaries. Some of whom are directly involved with NASA's future - and had a definite opinion about efforts to turn NASA away from the use of ATK's solid rocket motors in favor of rockets produced by private space companies. "The one successful launch that they have had, that's primitive compared to what you are going to see here today," said Senator Orrin Hatch (R-Utah) who attended the test-firing. "They are a long way away from where we are today; my worry was that it was beginning to look like a political exercise rather than what was in the best interests of our country." 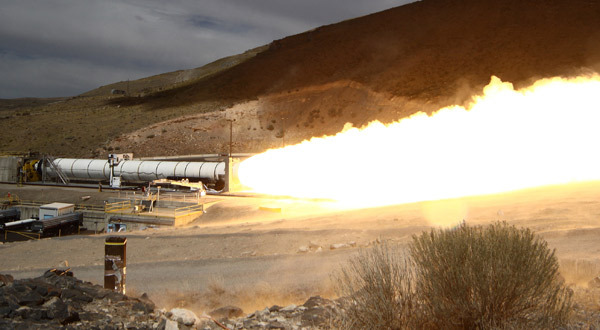 This test was conducted to gather data on over 50 designs of the Ares system. Some of these include new insulation, a redesigned rocket nozzle and the motor casing's liner. When the DM-2 was activated, it produced approximately 3.6 million pounds of thrust, roughly about 22 million horsepower. The motor itself was covered with some 760 instruments used to measure and collect important data when the rocket was fired. The sand in the blast range of the rocket was converted into glass. To get a view of the moment of ignition, a mirror is place directly in front of the engine nozzle you might be able to find what's left of it - if you looked hard enough. The horizontal ground test firing is what is known as a "cold motor" test. To make this possible, the DM-2 was chilled to 40 degrees F to measure how the motor performs at very low temperatures. The test also was held to prove out design specifications of new materials used in the motor joints. These materials will remove the need for joint heaters (these heaters were required in the 4-segment version of the motor's design). It is hoped that these modifications will greatly reduce weight, simplify launch operations and make the system overall far less complex. The DM-2 is comprised of Solid Rocket Booster (SRB) segments that have flown on 57 shuttle missions. All SRB segments are recycled. Once jettisoned from the space shuttle they are recovered out in the Atlantic Ocean via the Freedom Star and Liberty Star recovery ships which are then shipped back to ATK's plant where they are broken down into their individual segments and refurbish them for the next mission. "Mother nature cooperated with us today," said Kent Rominger, a former shuttle astronaut who now works as ATK's vice president of Test Research Operations. "We saw 3.6 million pounds of thrust out of this motor today, truly an awesome display of what this system is capable of."